An introduction to the life of a dairy farm wife wouldn’t be complete without getting to know the parlor. No, I’m not talking about a sitting room with Victorian wingbacks and frilly curtains. I’m talking about a parlor with swinging gates, long rubber tubes, and occasional plops of warm manure on the concrete floor. As you may have surmised, a large part of this whole dairy operation is milking the cows. This takes place in a milking parlor. A city slicker like me had little idea how dairy farming actually works. My image of a straw-hatted farmer on a three-legged stool milking each cow by hand is vastly outdated. 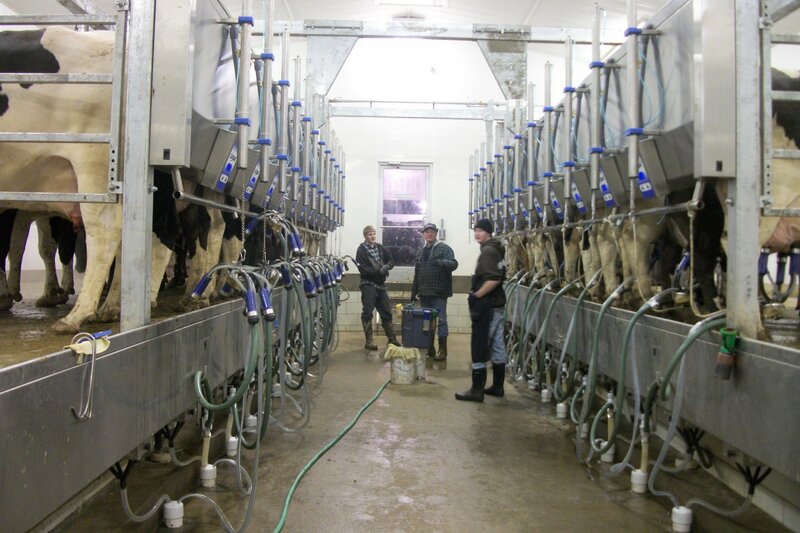 Between two facilities, my Dairy Man and his father milk over 800 cows. The idea of milking by hand is laughable. So, let’s step into the parlor. Our bovine ladies are herded into the milking parlor twice a day. My Dairy Man and his employees coax the cows into their places and hook them up to robotic, spider-like machines that act as vacuums, pulling the milk into several large tanks in another room. After they have been milked, the large animals independently tramp back into the barn to spend the rest of their day eating and making more manure. And there you have it. That’s where milk comes from. I have shared a little piece of my knowledge that didn’t exist in any form before I met the Dairy Man. Sometimes it’s alarming how much space in my brain is occupied by all things cow. And how unfazed I now am by the smell of manure. Your blog is awesome! I loved reading it! !